Cubs pitcher Jack Pfeister throws a pitch in the 1906 World Series. The terms "North Siders" and "South Siders" are synonymous with the respective teams and their fans, setting up an enduring rivalry. The White Sox currently lead the regular season series 49–44. There have been nine series sweeps since interleague play began: six by the Cubs in 1998, 2004, 2007, 2008, and both series in 2013, and three by the White Sox in 1999, 2008, and 2012. The Chicago Transit Authority's Red Line runs north-south through Chicago's neighborhoods, stopping at Wrigley Field and Guaranteed Rate Field. Halsted Street (800 W) also runs north-south passing each park within a distance of .5 miles. While teams in New York City (such as the Yankees, Giants, and Brooklyn Dodgers) routinely played against each other in World Series matchups throughout the 1940s and 1950s, the two Chicago teams only met once in the 1906 World Series, a celebrated event that seemingly put the city on hold for a full week. The heavily favored but young Cubs (who had won 116 games in the regular season) lost in six games to the veteran and pitching-strong White Sox, "The Hitless Wonders." Between the teams meeting in the 1906 World Series and the beginning of interleague play in 1997, the Cubs and White Sox would routinely meet, usually yearly, in exhibition matches, which did not count toward the teams' rankings in their respective league standings, which took away some of the excitement. At best, they provided bragging rights to the winner. Since interleague play began in 1997, the White Sox and Cubs have routinely played each other six times each year (one three-game series at each stadium). Based on the availability of tickets and the prices offered through ticket brokers, these games are among the most anticipated of the season. These games have featured a variety of heroics, perceived slights, and errors on both sides that have added fuel to the rivalry. In 2008, the teams played each other as leaders of their respective divisions for the first time ever: the White Sox in the American League Central and the Cubs in the National League Central. Also for the first time in the rivalry's history, both Sunday games to end each series were televised nationally on ESPN's Sunday Night Baseball. 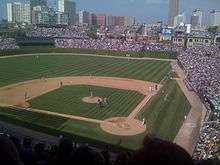 The Chicago Cubs swept the White Sox in the first weekend series at Wrigley Field, and the White Sox subsequently swept the Cubs at U.S. Cellular Field during the second weekend series, thus splitting the series 3–3 and resulting in an all-time interleague series tie of 33–33 through 2008. The BP Crosstown Cup was introduced in 2010 and the White Sox won the trophy the first three seasons before the Cubs finally won it in 2013. The Cubs winning the 4 games of their 2013 series marks the interleague series at 49–45 to the White Sox. In 2014 the White Sox reclaimed the Crosstown Cup after winning the first three games of their four-game series. They won the first two games at Wrigley Field 3-1 in 12 and 4-1 respectively, came back to U.S. Cellular Field to win 8-3 before getting blown out in the final game 12-5. The rivalry turned physical on Saturday, May 20, 2006, when a brawl broke out during a White Sox-Cubs game at U.S. Cellular Field. In the bottom of the second inning, Brian Anderson of the White Sox hit a sacrifice fly, attempting to score catcher A. J. Pierzynski. Pierzynski collided with Cub catcher Michael Barrett. Barrett dropped the ball in the collision and Pierzynski was safe. After slapping home plate in celebration, Pierzynski began to walk away, but Barrett blocked his path and punched him in the jaw. Both benches cleared and a brawl broke out. Umpires debated for 15 minutes before ejecting Pierzynski, Barrett, White Sox outfielder Brian Anderson and Cubs first baseman John Mabry from the game. When play finally resumed, outfielder Scott Podsednik promptly got on base, loading the bases up, and second baseman Tadahito Iguchi cleared them with a grand-slam. The White Sox won the game, 7–0. Michael Barrett was suspended for 10 games, while Brian Anderson was suspended for five and A. J. Pierzynski was fined. When the new Comiskey Park (now called Guaranteed Rate Field, previously called U.S. Cellular Field from 2003-2016) was built, many in the media and baseball (including both Cubs and White Sox fans) called the park "sterile", and lacking the beauty and personality of the old park, even though many seats at the old park were cramped, behind posts, or in the outfield. Others contend that in contrast Wrigley Field is dirty, uncomfortable, and generally unpleasant to be in. Regardless, this again set up a point of rivalry as Cubs fans had their classic park, while White Sox fans had their modern park. Former Sox manager Ozzie Guillén said of Wrigley, "But one thing about Wrigley Field, I puke every time I go there", further polarizing this point of contention. While several renovations to Guaranteed Rate Field have silenced many criticisms, such as the improved upper deck and bleachers, the difference between the fields remains a point of rivalry between fans of the teams. Until 2004, WGN-TV and the now-defunct FSN Chicago would "switch off" during interleague games: for the Cubs home games, the Cubs commentary team would call the game, while the Sox commentary team would have the call for their home games. Starting in 2005, both WGN and then newly created Comcast SportsNet Chicago show the games on each network with both commentary crews at the same time, allowing the viewer to watch the game without an opposing team bias. The stations generally switch off each day (For example, in a series at Wrigley Field, WGN would treat the game on Friday as a Cubs home game with CSN treating it as a White Sox away game; on Sunday WGN will broadcast a White Sox away game and CSN will show a Cubs home game; with the other game alternating between WGN and CSN). While New York of the 1940s and 1950s often had two or three teams vying for championships, the two Chicago teams had comparatively little to celebrate for a long time, except for pennants in 1945 (Cubs) and 1959 (Sox), until the White Sox won the 2005 World Series. Historically, each team's fans felt bad for their own team's relatively poor performance, but took solace in that the other team was doing just as badly. Thus, the rivalry often was one in which fans of one team are just as happy for the poor play of the other team as they are for the good play of their own (schadenfreude). This above all is what made the Chicago rivalry unique in Major League Baseball. An examination of other great rivalries (Yankees–Red Sox, Mets–Yankees, A's–Giants, Dodgers–Giants) shows that both teams have made World Series appearances on a fairly regular basis. Several Cubs and White Sox fans have made a cottage industry selling shirts, hats, and other souvenirs that include slogans intended to take swipes at the opposing teams, rather than support their own. Time reported that 36% of Cubs fans were rooting against the White Sox during the 2005 World Series. White Sox Fans wave the Blue Cubs Loss flag after their team defeats the Cubs in mockery of the Cubs Win Flag tradition. Team owners naturally encourage such rivalries (two-time Sox owner Bill Veeck was a master at it) in the hope that they will translate to increased gate receipts, and the Cubs-Sox interleague games have borne out that theory. President Barack Obama, an avid White Sox fan, has taken verbal jabs at the Cubs on several occasions. When the New York Yankees (managed by former Cub Joe Girardi) visited the White House in honor of their 2009 World Series championship, Obama said, "It's been nine years since your last title—which must have felt like eternity for Yankee fans. I think other teams would be just fine with a spell like that. The Cubs, for example." Obama however, has stated that while he is aware that many people hate the other team, he does not hate the Cubs and wants them to win as long as they are not playing the White Sox. The Chicago Cubs won ten National League championships between 1901 and 1945, and also had among the best winning percentages in the NL up to that time (3796-3022 for a 0.557 winning percentage). The Cubs had a 2 games to 1 lead over the Detroit Tigers in the 1945 World Series, when on October 6, 1945, Cubs fan and local tavern owner Billy Sianis was prevented from reaching his seat because he was accompanied by his pet billy goat. Local legend says that he responded by placing a curse on the Cubs to never again win the World Series, which they have not been able to until 2016. The Cubs, on more than one occasion, have featured a tongue-in-cheek promotion where billy goats are brought into the stadium to be offered as an apology. Some historians argue that the genesis of the curse goes back much farther; that the allegededly underhanded way they won the 1908 pennant (leading to their last World Series win) angered the "baseball gods". For lack of a standard term, this could be called the curse of Fred Merkle, since he was at the center of the controversy. Every post-season they have participated in since then seems to have featured a disaster of some kind, from Hack Wilson losing a fly ball in the sun, to Babe Ruth's called shot, to the "Steve Bartman incident." When they won the division in 1984, their first title since 1945, manager Jim Frey shouted in the champagne-soaked clubhouse, "The monkey's off our back!" Some fans took that as the kiss of death... which it proved to be, as the Padres late-inning rally in the final game in San Diego featured a ground ball slipping under the glove of first baseman Leon Durham... an eerie precursor to a similar and much-more-memorilazed incident with the Red Sox and former Cubs first baseman Bill Buckner that would occur two years later. That requires a quick mention of the "Ex-Cubs Factor", an offshoot of the main Cubs "curse": that any team reaching the post-season since the 1945 Series, and having 3 or more ex-Cubs, was almost certainly doomed to lose in either the playoffs or the Series due to "a critical mass of Cubness". The 1960 Pirates had been the lone exception until 2001, when the Diamondbacks effectively ended talk of that curse by winning the Series in a dramatic finish that featured 2 of the 3 ex-Cubs, one of them (Luis Gonzalez) making the game-winning RBI. The White Sox had the best winning percentage of any American League team from 1901 to 1920 (1638–1325 for a 0.553 winning percentage), but quickly slipped to among the worst teams after that. Many point to the Black Sox scandal surrounding the 1919 World Series as the point in history that changed the White Sox fortunes. Eight White Sox players conspired to intentionally lose the World Series, and in 1920 were banned from baseball for life. While the White Sox won 4 AL titles in the first 20 years of their existence, they would win only one more league championship in the twentieth century. The term "curse" has seldom been used as such, since the scandal was perceived to be something the players did to themselves rather than being wrought by the front office conducting ill-advised transactions or committing public relations gaffes. In fact, many White Sox fans take offense to the term "curse." Still, a pall seemed to settle on the franchise (along with a slim budget), and it would be the last years of the Eisenhower administration before they would win the league championship again. When the White Sox clinched the pennant in '59, broadcaster Jack Brickhouse capped his play-by-play with, "A forty year wait has now ended!" The 2005 pennant ended a forty-six-year wait for the next one, while the 2005 World Championship ended an 88-year wait for a World Series victory. This adds a decidedly interesting twist on the rivalry as there were, until 2005, very few fans for either team who were alive to see one side actually claim a title while the other waited. Note: Pennants won by both teams, also include pennants before the Modern World Series. As of November 3, 2016. 1997 White Sox 1 2 3-game format. Played at Comiskey Park II. 1998 Cubs 3 0 First season series sweep. Played at Wrigley Field. Cubs win the NL Wild-Card. First extra-inning game. 1999 White Sox 2 4 First year of 6-game home-and-away format. 2000 Tie 3 3 White Sox win the AL Central. 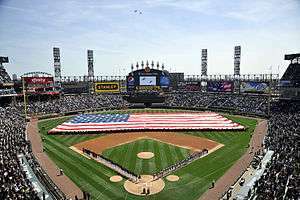 2003 White Sox 2 4 Comiskey Park is renamed to U.S. Cellular Field and hosts the All-Star Game. Cubs win the NL Central. 2005 Tie 3 3 White Sox would win their 3rd World Series and their first in 88 years. 2006 White Sox 2 4 A. J. Pierzynski, Michael Barrett incident. 2008 Tie 3 3 Played each other as leaders of their divisions for the first time. The clubs swept each other at their home parks. Both clubs won their divisions. 2009 White Sox 2 4 First time a Cubs/White Sox game has been postponed to a later date. 2010 White Sox 2 4 The BP Cup is introduced. Carlos Zambrano incident. Cubs ended White Sox 11-game winning streak. 2012 White Sox 2 4 Third series sweep, second in Wrigley Field. 2013 Cubs 4 0 First year with four-game format, second season series sweep. 2015 Tie 3 3 Series returns to six-game format. Cubs win NL Wildcard. 2016 Tie 2 2 Series returns to four-game format, with both teams splitting the series for the second year in a row. Cubs would win their 3rd World Series and their first in 108 years. This is a list of results from all of the meetings between the Chicago Cubs and Chicago White Sox from their first meeting in 1906 to the present. Subway Series, New York Mets vs. New York Yankees, etc. ↑ Merkin, Scott (June 21, 2007). "Buehrle Opens Windy City Showdown". MLB.com. WhiteSox.com. ↑ Jameson, Deirdre. "This Weekend". USA Today Sports Section. Retrieved 15 October 2016. 1 2 Dodd, Mike; Keen, Judy (October 3, 2008). "There Are Two Sides To the Story for Cubs and White Sox Fans". USA Today. 1 2 3 "Cubs' Barrett slugs Pierzynski, leads to melee". ESPN.com. Associated Press. May 20, 2006. 1 2 "Cubs' Barrett slugs Pierzynski, leads to melee". ESPN. Retrieved October 23, 2008. ↑ "Cubs' tempers boil, bats fizzle as ChiSox win". ESPN.com. Associated Press. May 20, 2006. ↑ "Barrett suspended 10 games for igniting brawl". ESPN.com. Associated Press. May 26, 2006. ↑ Thigpen, David (2005-10-23). "Every Year, a Miracle". Time. Retrieved 2008-10-06. ↑ "Obama Tweaks Cubs. Again". Chicagoist.